This is a square Admiration Coffee porcelain sign. This particular Admiration Coffee sign is predominantly navy with white, blue, and red text. 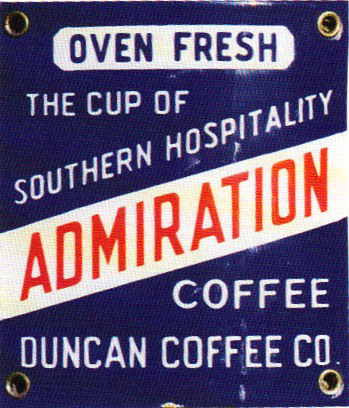 It reads, “Oven Fresh, The Cup of Southern Hospitality, Admiration Coffee, Duncan Coffee Co.” and has no other design.